Would the threat of the Earth really come true? Would Pele be coming to alter our view? To add blood red wine to our green palette’s hue? Lovely, Albert! You ought to publish these..
wow, you are so talented that was beautiful. How energetic was the vent drop? I would have run like hell. … which makes this a really interesting place to perform this song. (Think 79 AD) Because that’s pretty much what most people were doing… or trying to. Nice to meet you. And so sorry about your friend’s home. @Albert – very nice piece of poetry! Now…here’s a drone vid from yesterday of Halema’uma’u. It’s already getting so big that it’s starting to swallow up the Overlook parking lot. A good chunk’s already gone. It’s probably likely only a matter of time before it’s entirely gone! Pity its now pitch dark. Its quite nice if you add a still for distant viewers…. OOops, my apologies. Its a hirez video and takes a while to load. Worth a watch as it has a stabilised camera taking the pix so its really excellent quality. One little problem – how on earth do I post a video as an actual video, not just a link to click? You can’t directly post the HVO videos, I think someone has to embed them and you need admin powers for that. It’s actually hit or miss depending on the video source/formatting and how WP recognizes it. I’ve had youtube vids come up as links instead of embedding, even with using the provided embed code. A very smart idea. No more building in lava zone 1 is being officially considered by people who can actually make that decision. I guess anything still there will be allowed to stay but the new lava isn’t going to be built over which means something else could be done with it. That is a very good list you have made. Most of them just say where it happened and when, but yours also has the more specific location. You have also included the many small eruptions accompanying the more long term ones, including the tiny 2007 eruption on the side of kane nui o hamo that most sources dont seem to know about. If there was a detailed online map like the one I made a picture of before, I would put all the historically active vents on it outlined in a bright colour, but I cant seem to find one (I know it exists though). It has been called the golden pumice because it is yellowish and shiny, although I think HVO is calling it ‘layer G’ now. It was thought to date from just before 1820 but it has since been found to be older, but younger than the footprints ash from 1790 so kilauea was definitely not dormant between 1790 and 1820. Likely it was very frequently active from vents at the bottom of the caldera that have no record because they are long buried, but occasionally some of them went way bigger and their products escaped the caldera. The last one of these happened in the early 1800s probably less than a decade before Ellis and his crew went exploring in the area. For comparison, Kilauea Iki in 1959 was what, about 580 m (1900 ft) or so? This is, of course, the highest historically recorded lava fountain in Hawai’i. I vaguely remember something from this site (I think) about even taller fountains having could’ve occurred in the past in Kilauea Caldera. And it has to do with given evidence of extensive tephra deposits extending from the caldera. Yes kilauea iki was somewhere about that high. The fountains that happened in the caldera would have been far higher than that though as the tephra extends even further from the vent area than the 1959 tephra, and the vent would have been about 500 or more meters below the rim of the caldera. These fountains were probably too tall to generate significant lava flows upon landing, and any that did happen would have been in the caldera, so there would be no real record of that eruption happening after a few years. It is possible that the 1790 eruption was just one of these eruptions that became explosive because it happened in a more wet part of the caldera. There is a possibility that the next eruption at kilauea will be something like this too, not quite as big as that but I dont think we should assume that continuous eruptions is the same as gentle eruptions. The pre-1924 lava lake was gentle because the magma supply was very low at that time. A high magma supply like now could result in some far more impressive eruptions. Aila’au started with lava fountaining because there is fountain tephra in the side of kilauea iki. The aila’au lava flows would have have had to be fed by a flow rate of a minimum of twice the average flow rate of pu’u o’o flows in order to actually flow as far as they did (June 27 flow rate about 5-7 m³/s when it flowed into Pahoa 24 km away), but aila’au is twice as long as pu’u o’o with only a slightly bigger erupted volume so if it was continuous it would have about half the rate of pu’u o’o and hence the lava flows would have traveled a maximum of about 12 km from the vent. Instead, the lava flowed over 40 km away so the lava flows must have been episodic and quite big when they did erupt, and as such the flows were probably only actually extending far from the vent for about a third of the actual eruption. The summit activity before 1840 was described as being extremely vigorous as to the point of being violent, probably indicating there was significant fountaining activity at that time. The magma supply rate now is about the same as at that time so eruptions in the near future are likely to be vigorous and rapid. “Vigorous to the point of being violent” -makes me think it could have resembled the Marum lava lake on Ambrym at the time of that now-famous video what do you think? Probably in some parts yes. At the time this happened basically the entire caldera was a lava lake basin that would drain when intrusions happened to leave the source vents as a line of craters that roughly went northeast southwest. Before the 1823 eruption the entire crater was apparently a single continuous lava lake based on the stranded bench left behind after the lava drained out. The same sort of thing happened before 1840 but the eruptions were even more vigorous. Titus Coan is known to have recorded this period of activity and he said it looked like a ‘cauldron from hell’. I drew this picture showing what some of these lava fountains could have looked like. The picture is from kilauea iki looking towards HVO. Obviously when those eruptions happened kilauea iki was way deeper than it is now, and there was nothing on the side of it where the 1959 vent is, but overall it works fine for this. Chapter 18 is interesting regarding Kilauea summit observations in 1850 by a local missionary. The following chapters are interesting in the descriptions of Mauna Loa eruptions of time and the massive quake of 1868. Reads more like research field notes than zealotry. I highly recommend the Coan documents. It’s a time slice of humanity dealing with what seems to be a mirror of the current episode. The part that intrigues me are the narratives of the ocean activity. It resembles tsunami activity that just keeps on occurring. Evidently these accounts were accompanied by repeated mass wasting events from the local shelf. Thank you both for taking the time to appreciate the history of it. As always, you’ve made me (us) feel privileged just to get a chance to share in the wonders and heartache of nature’s reality through your eyes and words. The lava river is open and fast flowing all the way to past where four corners was. I think that it might be the biggest river in Hawaii when you consider the flow rate. A lot of the lava dlowing into the ocean is pahoehoe now too, so the lava in the channel must be staying very hot all the way to the ocean and not changing into a’a anymore. Based on what happened when the main river of the 1840 flow reached the ocean, a big littoral cone could form at the kapoho ocean entry. 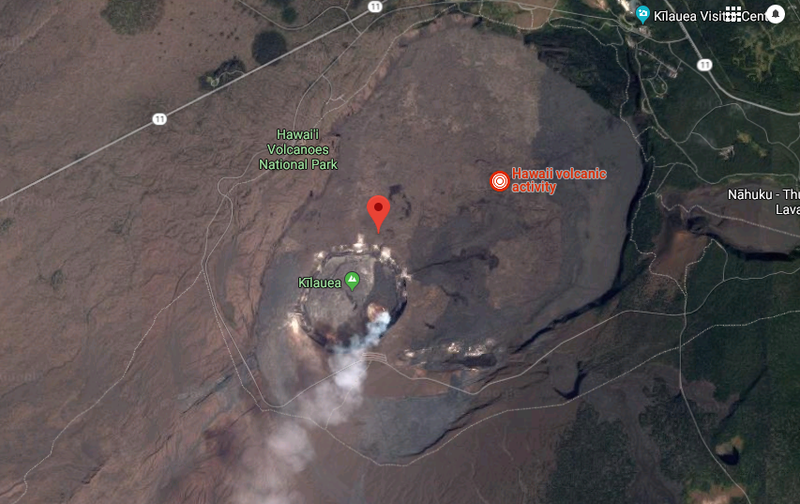 One of the 1790 flows also has a littoral cone I think too, and so does the 1868 flow from mauna loa, so if lava flows as a channel into the ocean slowly (as it would on a flat plain) it might be quite normal for this to happen. I guess it didn’t happen in 1960 because the flows weren’t localized to one channel for very long. This is a picture of the fissure 8 cone from earlier today: HVO has confirmed that it is 50 meters tall, and as this was in the morning it is probably even taller now. This is a video of the lava river flowing past. I doubt that the road is 10 meters wide. That would be a four-lane highway. The car should have parked completely off the road. I would indeed estimate the road between your drawn lines as 5 meter. I think lava peaks at around 60 km/h in real life. It may well be getting close to that. It is an impressive eruption. Once may wonder why the lava has sped up. It might be due to a narrowing of the channel. The channel does look narrower in the overflights. I think that once the channel becomes established downstream, the lava that is ponded in the areas further up will drain down a bit. The lava channel is visibly incandescent all the way from the vent down to past kapoho crater/green mountain/ four corners area. In response to this it has been noted that overflows have become infrequent in the last few days as the lava flows inside a stable channel now. You may also be fooled by the perspective. Your lines are only correct if the section of the road and the lava are in the same plane. Any difference in the slope or elevation will directly lead to errors in the estimated length. A look at the video (for a as long as facebook allows before demanding an account) suggest a speed of the lava of around 5 m/s. That would be close to 20 km/hr. The hot part is very laminar. But the fast flow will not be deep: of order 1 meter, perhaps. It is way deeper than 1 meter, I dont know how deep it is but the flow rate probably wouldnt fit through a channel that small. The lava channel is about 20 meters wide when it flows out of the cone, and the fact there are standing waves means there must be some depth to the flow where that is. I would guess the flow is about 3 meters deep at a minimum. Lava flows look deceptively small because their high viscosity prevents the lava from spraying in the fast parts of the channel, but this lava is basically a volcanic equivalent of a raging rapid and those almost always form in a deep channels. The fast flow can’t be all that deep. At 5m/s, and a width of (at minimum) 20 meters, the flow rate is 100*depth m3/s. So the depth can’t be much more than 1 meter. The deeper and wider part is flowing much slower. And that is what laminar flow does: the velocity changes smoothly with depth. On some of the videos you can see that the fast flow is surrounded by a much slower, partly crusted flow. A standard “lane” is about 9 feet by many DOT standards in the US. That’s generally the max load width when road work is being done in an area. In the webcam there’s a faint spot of light at the edge of the flow, caught in the four o’clock ‘lens flare’ from the main eruption. It’s been there for the past few hours. Is it a break out from the lava flow? I’ve been very busy of late, so I’m playing catch up ! I’m sure yesterday’s 5 stars around Bardarbunga have not gone unnoticed, but I haven’t seen any comments. I think we were waiting for Tomas to say ‘I told you so’. The quakes were quite shallow. If I understand things correctly… Some of them are shallow enough to be ice quakes, whilst others are somewhat too deep for that? Well I suppose if it’s anything significant there will be other signs and portents in the near future. Ice quakes are not included in the Icelandic quake lists, these are all tectonic quakes associated with the ring fault. When I have looked at quake depth distribution previously, they are quite uniformly distributed between 0-10km, so nothing really remarkable here. There were a couple of comments below the previous article, but I think they went unnoticed since Albert dropped such a masterpiece before anyone had time to read them. Really it is sort of strange that fuego and pacaya are so different despite erupting the same stuff and being near each other and with a similar appearance and history (major flank collapses). Fuego usually erupts explosively despite its fluid magma composition and even when it does produce lava flows it is so steep that they just disintegrate in nearly all cases, and it doesn’t appear to have ever had any flank eruptions of any size at all. Pacaya seems to have large lava flows, as you would expect from an open vent basalt volcano, but when they flow on its equally steep sides they do so without any major collapses, and flank eruptions seem to happen very easily there. This is definitely a good question for Carl. Oops copied the whole row. Below at the list a 4 and 3 3’s . Quite some activity now at Kilauea caldera, a M2 plus almost every minute! I have a hypothesis I think we could easily test. The size of the large explosions/quakes is proportional to the amount of energy released in between the large quakes. So more quakes and or longer time between quakes, larger relief quake. New gif posted by USGS. A part north of the eruptive vent has started to slump also now. What stands out at the moment, the quakes are spreading more around the caldera. I wonder something is changing in the “usual” pattern. Just because the quakes are spreading out doesn’t mean the whole caldera is going to collapse again. The outermost visible caldera fault is twice as big as the actual edge of the caldera pit, but it didn’t move very much when that formed so the collapse isn’t necessarily the same size as the outermost crack. The amount of magma that has left the summit is less than 10% of its volume and most of the magma feeding into the lower east rift, including all of the actual lava, has come from the storage areas in the upper east rift, between mauna ulu and pu’u o’o. The linear deflation that Albert reported on that is showing on the pu’u o’o GPS is indicating that area is deflating with little new supply, so the summit magma is probably not actually getting into pu’u o’o anymore. That also means it is very unlikely for pu’u o’o to reactivate after this. Most if not all of the collapse at the summit is because the conduit feeding the former lava lake was effectively a hole and when the magma withdrew from that the walls fell in. It is likely that the conduit was bigger at depth and shallow sills and dikes probably existed under other parts of halemaumau, so when all of this drained out there was little support and things just collapsed. This is not piston-like collapse of a plug like what was observed at bardarbunga or the crater would be symmetrically lowering, which it isn’t. Likely in the future it will become more symmetrical due to collapses of the steep parts of the rim but we know it didn’t start that way. In 1924 there was also an open vent system and the same thing happened. In 1960 there wasn’t an open summit vent so the collapse was much less noticeable and mostly happened because of still molten 1952 lava draining into cracks. The scale of this event is bigger than 1960 but probably not as big as 1790 and the 1790 eruption was nowhere near big enough to create a new caldera, despite the previously long held assumption. In 1924 there was supposed to be a reservoir as shallow as 1 km deep that was destroyed. I am not that sure about the linear deflation meaning that no new magma from the summit is arriving to the ERZ reservoirs and I would say that magma is leaving faster from Pu’u’o’o to Puna than the magma recharging it which is still coming from the summit. The deflation at Mauna Ulu and Pu’u’o’o is very small, <1m, for such a voluminous eruption and the GPS being in the areas where the reservoirs should be I would expect much more than that if there was no resupply. The transition to a linear deflation may be because of the intrusion becoming stable and passive or because of the arrival of the summit magmas. Remember that pu’u o’o inflated nearly a meter at the webcam before this started, and because it’s magma system was so shallow it more just pushed the floor of the crater up instead of the sides, the inflation of pu’u o’o was on the order of tens of meters easily. Also the storage capacity of the area between mauna ulu and pu’u o’o is much more dispersed than the summit magma chamber, so deflation there probably isn’t going to be that high at any particular location at the moment, although as the area drops over time new pit craters could appear in the future as the cavities collapse until they break the surface. This situation probably happened in 1790 too, with the upper and middle east rift being filled with magma leading to frequent eruptions between 1650 and 1790, before the whole thing was drained out in 1790 and the caldera collapsed at that time. There was a very shallow magma storage in Pu’u’o’o that suddenly collapsed at the beginning of the intrusion and it was probably so shallow that inflation from it wouldnt be noticed in the GPS but the same cannot be said for the other reservoirs. I dont know the exact depth of the magma bodies but I think they are 3-2 km deep (same as the summit reservoir and were geologists I think place them) and that would cause a wide area deflation. The GPS of both Mauna Ulu and P’u’o’o showed a very fast drop at the beginning (they are capable of picking up strong defation events) that soon slowed, so I think that means that a major drainning of the ERZ reservoirs would be more dramatic in the GPS and that right now summit magma is partly replenishing them. The shallow Pu’u’o’o reservoir is comparable to the one that existed at the summit before 1924 and maybe to the former at Kane Nui o Hamo. Pit craters like Makaopuhi, Napau, Alae, Pauhai… probably formed from reservoirs similar to the south caldera current chamber but most of them smaller. Maybe the one that existed before 1924, which I think I recall being able to inflate a very small area in the caldera so that the tiltmeters didnt notice it, formed during the summit activity that had been going on for a century or more in a similar way to how sustained vents like Pu’u’o’o and Kane Nui o Hamo develop very shallow small storage during their activity. See one of my above comments about this sort of activity. Your are assuming a lot in your comments here Turtlebirdman. Don’t get me wrong, you are really at it and I admire that in some way. But I think there are many questions we simply cannot answer (yet), you are a lot going into details. Witnessing events like this haven’t been done that intensive before. I think a subsidence of a caldera floor does not always takes place with a large boom. The Bardarbunga Holuhraun event wasn’t either. One thing I (think I )learned past years of volcano watching that every single eruption has its own specifics. If I remember correctly, during the Bardarbunda episode the assumption was made that a Full Caldera Collapse is a rare event and that “moderate” subsiding occurs more often. We are able to see by the USGS equipment this eruption is affecting the complete caldera area for sure. 10% of the magma has left the summit … that is an estimation, it might be far less. We simply do not know if and how a deeper source does affect this eruption. wow, look at 11 56 at the live stream KIlauea summit, you can actually see a part of vents rim collapsing! Also there was a huge jolt on the camera at the 4.0 earlier today. Looking at the latest estimates it was probably this one if location accurate that’s about 200 metres from HVO. Low whistle. That was something to see! Thanks for spotting it! That was at the northern part of the vent slump. Screenshot “latest earthquakes” USGS website. Selected option “1 day all magnitudes”. Zoomed to Kilauea caldera southern part. Some ring patterns occur at the southwest-west region of the caldera. Mick Kalber, the guy from Paradise Helicopters who comes up with all those greatl eruption videos on Vimeo has suggested a name for the Fissure 8 cone: Pu’u Ai La’au (Forester Eater Hil). NPIT going for some kind of record I think. Thanks. For the lesser brained, knowing what NPIT is would be a real help! Thank you! Sorry been mentioned here a few times recently. It’s the GPS located here according to Google Maps. Thanks! With all the Po’o and A’a, not to mention Alleluia, being hit with NPIT was too much for me on a late evening…lol. Now I know and thank you. I think “where” would be better question. what is this and did it fall off the edge?? NPIT is a gps in the edge of halemaumau. It is in the process of falling into the crater right now as it sits on a big block that is sliding towards the deepest part of the crater. Actually it is a tiltmeter not a gps. It is definitely listed as a GPS station by USGS although tiltmeter KNP is very close to it. KNP doesn’t seem to have returned any data for a few weeks now. “CAUSE OF DEATH: Attempted to catch tilt-meter and was struck by equipment shelter." Hi Sqounk, what did you search for with google maps when looking for the gps location? Are all the USGS GPS and tiltmeters available on a map somewhere? Video showing the flight over the crater . What is the theory/knowledge about the formation of Kilauea’s big summit crater? Was it formed during an effusive flank eruption, like the ones we know from Iceland? Presumably yes but it wasnt on land or we would have found an eruption that big. There was probably an eruption on the puna ridge at that time because the vent would have to be below the summit chamber to cause a collapse like that. Eruptions in lower puna are still above most of the upper chamber so they cant cause caldera eruptions in theory. The current eruption is one of the biggest eruptions known to have happened in that area, but it is still far too small to cause a caldera collapse. The volume of the caldera when it formed was about 4.5 km3 so we need a fast eruption of about that much magma to account for that volume loss, and there are none on land so it was logically underwater and very likely on the puna ridge. Based on how much magma seems to be able to stay in the subaerial part of the rift without erupting, even using all of the rift length it very probably isnt capable of containing a 4 km3 intrusion so somewhere down there is a very big lava flow. Not quite as bad as that, I think. Only part of the evacuated magma may end up on the surface. Part of it fills the rift. In Iceland, the majority (80%) stays in the rift. In Hawaii, the ratio may be different, but you still may only need an eruption of 1-2 km3 to explains a caldera of 4.5 km3. If the current eruption is a guide, a large earthquake related to a slump may have been the trigger. Now Pu’u’O’ had the correct size to give such a caldera but didn’t, because it erupted into a stable plumbing system with outflow=inflow. 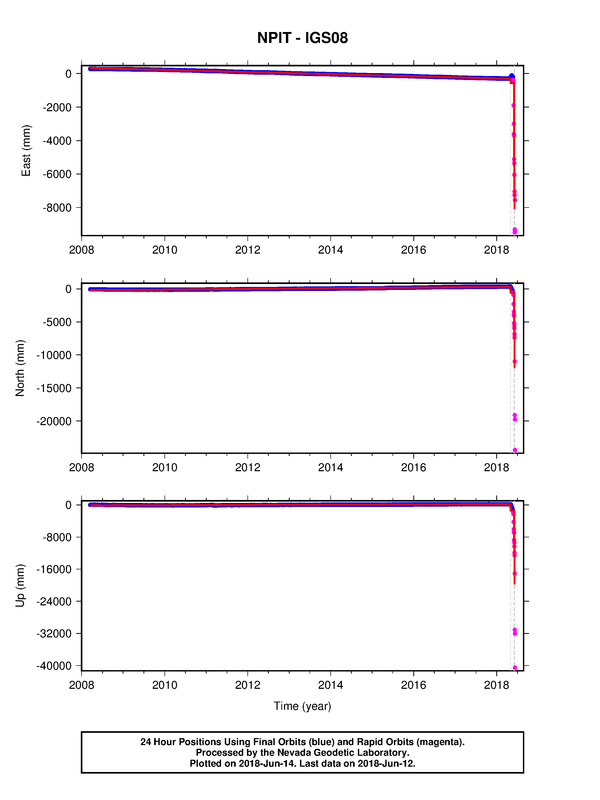 It lost that equilibrium only over the past year or so when the eruption rate became less. So I think you would be looking at a change in the plumbing, perhaps the opening of a deep dike, which destabilised the main magma chamber. But let’s see. If this eruption continues for another month, the caldera may look very different from now. There still isnt a lava flow on land that is big enough to explain the caldera, so there must be something underwater. In regards to the current summit collapse, I have thought about it a lot (as I’m sure is obvious by all the comments…) and from the gifs of the collapse, the majority of the collapses seem to be from the edges sliding in towards the deep pit. This initially happened from the southwest but now the north is joining in too, and the pit hasn’t really gotten deeper in a while. The summit eruption started in 2008 but there were signs in 2007 and also way back in 1992 that activity at the summit is still possible despite an eruption on the east rift. Particularly the 2007 activity is almost certainly the cause of the overlook crater eruption, possibly through an initially failed eruption that formed a series of dikes and sills at shallow depth and then one of them collapsed when magma withdrew to pu’u o’o again (probably on July 21st). The pit craters can take a long time to actually appear on the surface, hence why I have said that new pits might start appearing over the next few months or years even as inflation resumes. My point being that the 2007 activity likely resulted in shallow sills forming, and maybe that is what these collapses are sliding on, and also what they collapsed into in the first place. This could also explain why HVO has discovered fresh magma in a lot of the explosions, as well as a few moments of incandescence that have happened in the webcam. Of course the actual main chamber is subsiding, but probably not at the rate that a collapse of this scale would be the expected result. The deflation at uwekahuna now is about 1.8 meters, the one in 1960 was only a bit smaller at 1.6 meters, but yet the 1960 collapses were pretty small and didn’t even last a year before fairly large eruptions started happening again, while the collapse now is huge. That, above all the other things, would indicate the actual deflation isn’t what is causing this collapse. I can imagine the scientists who worked their whole life studying Kilauea, must be greatly exited by all the data they gather during this event. But no evidence pointing towards when the caldera formation happened, or even a guesstimated time frame? The caldera formed between 1470 and 1510. The aila’au eruption (which ended in about 1470) could only happen when the magma was able to reach the vent, which meant it had to have a full summit magma chamber. Tephra starts erupting in around 1510 and that will only really happen on a significant scale when there is a deep caldera and both gas rich magma and the water table are able to add an explosive element to the eruptions. I believe the date is still unknown and I have seen authors that place it as late as the 17th century. I dont even think we can say it was a single event. No HVO have it dated to the 15th century. The transition from effusive to dominantly explosive activity would only really happen with a caldera forming. Likely it formed over a long time period but the initial collapse was probably rapid as it is recorded in a chant which describes ‘rocks flying’ which probably also means the event was not a passive one either. These could be explosions like we see now, but they also could be lava fountains too, and I the chant also describes it as being filled with lava, so it seems like eruptions happened on a significant scale almost immediately after the caldera formed. The caldera probably reached its current dimensions in 1790 though, but it was definitely there before that. Invest 91L seems to have croaked. The name Beryl remains available for assignment. What’s left of Invest 91L. There is still convection off the east coast of the Yucatan, but what was Invest 91L has dissipated en-route to Texas. The remaining convective area next to the Yukatan can still form a storm, but 91L didn’t make it. Probably a bad combination of an unfavorable MJO and part of the Bermuda High making for an unfavorable TS environment. That is good news. Mexico had worse luck, with two tropical storms making landfall within a few days. For info New Scientist 23th May 2018 has an article on Mount Tarawera and some good pix of the old pink terraces. New post is up. Who get’s the vote? Talented. Beautiful poem evokes visual images both inviting and annihilating. Please publish.